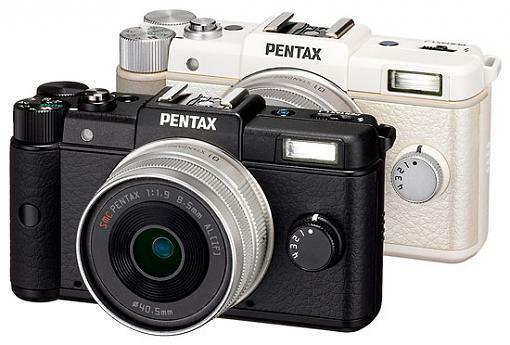 Pentax announced their own EVIL camera, yesterday. The camera is called the "Q" and they've taken a very interesting strategy, using a 1/2.3-inch backlit CMOS point-and-shoot sensor. That allowed them to make the camera considerably smaller than the Sony NEX. The camera is aesthetically beautiful - at least to my eye. I'm not sure about the image quality compromise of the smaller sensor, though. What do you guys think? Would you be willing to give up some image quality for an interchangeable lens camera that's smaller than the Panasonic LX5? I like the looks of it. If it is smaller than the Nex it may be to small for me. The Nex is pushing it. I got big clumbsy hands. To me IQ is the bottom line. I have really been watching DXO marks of late. I would never buy a camera that scored low, not at this point. That plus AF speed. To me IQ is the bottom line. I have really been watching DXO marks of late. I would never buy a camera that scored low, not at this point. That plus AF speed. Just based on the physics, there's no way the Pentax Q image quality is going to compete with Panasonic, Sony, Samsung and Olympus. But it is a lot smaller and for some people that will mean a lot. For me, the Olympus E-PL2 is plenty small. And the Micro Four Thirds lens options are pretty rich now. I also care about image quality a lot. So I don't think the Pentax Q is for me. But I really can't say until I see some image quality samples. I think they are trying to fill a gap that doesn't need to be filled. By the time a consumer wants something that small, that inexpensive, with that IQ, they will get an ordinary point and shoot. But we shall see how it works out for them. I think they are trying to fill a gap that doesn't need to be filled. That is a good way to put it in perspective. Wait, $800?? Baffles me, I assumed that this model would try to undercut the micro four-thirds and nex on price, but it looks like they are going for more expensive. That just seems ridiculous, jumping in with that, trying to compete with MFT and NEX, with that tech?! I'm confused, this looks like a terrible idea, what am I missing? What makes this not an abysmal idea? Last edited by Anbesol; 06-24-2011 at 11:23 PM. Might just be the novelty of it. Or maybe the image quality is going to be way better than expected? I don't know. I thought the same thing when I saw the price. At $800, I don't know how it can compete with a $600 E-PL2 with a better range of lens options. It is a back illuminated sensor, so s/n and low light/high ISO ought to be good. But it still doesn't have a dial lock, and those dials are asking to be turned as you pull it out of your (admittedly large) pocket. I don't understand what market segment it's going for, unless it's die hard Pentaxians with EVIL intentions. They'd be better off with an E-PL2 surely? Ought to be good for a point-and-shoot. It's still not a big sensor - not even by point-and-shoot standards. So the image quality will probably on par with a good consumer point-and-shoot. But probably not as good as a Canon S95 or Olympus XZ-1. Which brings us back to the question of, why? Last edited by Photo-John; 06-29-2011 at 03:08 PM. Perhaps this is all just for the novelty, and being competitive with technology and price is a non-issue for Pentax. Perhaps they need to sell it for so darned much because only so few people will buy it, that is the only way Pentax can maintain their small market segment. Its an offense to see them release such run-of-the-mill technology at such a premium.